Homemade BBQ chicken pizza made with bbq sauce, mozzarella, chicken, red onions and cilantro on perfect homemade pizza crust. Preheat your oven to 450 degrees F and prebake your pizza dough for 6 minutes. Spread a thin layer of bbq sauce on top of the pre-baked pizza crust. Then top with a thin layer of mozzarella cheese and sliced red onion. Add shredded rotisserie chicken to a bowl and cover it with a few tablespoons of bbq sauce. Toss to combine. 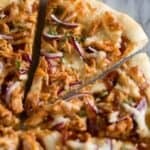 Spread chicken pieces over the pizza. Sprinkle another thin layer of cheese on top of the pizza, and add chopped cilantro, to taste.